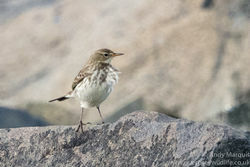 Until the recent split from Rock Pipit, Water Pipits were probably under-recorded in the islands. The records from Guernsey indicate the Water Pipit to be a scarce spring and autumn migrant, passing through the islands between late March and the second half of May. Returning birds pass through in October and November. The distribution of records show that coastal headlands and areas with fresh or brackish water, such as the Vale Pond and La Claire Mare are preferred, although these are probably the most watched areas in Guernsey.